With the taxpayer resistance, federal deficits and state budgetary deadlocks, declining real wages and job insecurity that ushered in the 1990s have come an increased sense of America's limits and the sunset of the notion of an ever-expanding economic pie. One expression of this prevailing awareness of limits has been increased skepticism about assumptions that immigrants are necessarily a good investment. Studies abounded in the growth years of the late 1970s and 1980s that assured citizens and political leaders that immigration meant enrichment — more tax revenues and less demand for services, job creation, rejuvenation of the social security system, and a major boost to the all- important consumer spending. Some of these studies, though professing immigration to be an excellent investment, were ambiguous in their actual data. Studies by the Urban Institute and Rand of immigration in California acknowledged that the taxes paid by their study populations of Mexican immigrants fell short of the state and county services provided them.5 The Urban Institute also found that Mexican immigrants were "substitutes" for low-skilled U.S. workers, particularly minorities, but ignored the fiscal costs of the consequent joblessness. The studies tended to discount concerns about rising fiscal costs of increasingly dependent and less-educated flows of immigrants entering in larger numbers through the non-job-related family reunification, humanitarian and illegal channels. Their rationale was that costs such as public health and public education were really an "investment" or that the less-skilled immigrants entering since 1970 would, with time, gain the skills for labor market success and achieve a greater fiscal contribution. A common assumption was that illegal aliens, being ineligible, used little public assistance. But the 1980s were a period of major expansion of the access of illegal aliens to public services. Until the late 1980s,state and local jurisdictions of major immigrant settlement were reluctant to stir immigrant constituencies by looking too closely at the costs. When they did, they limited their examinations to the costs of illegal aliens, who had less political clout. Stubborn high welfare dependency among refugees coming since the 1970s was recognized in the 1980s in Congressional hearings and by the Department of Health and Human Services. But state governments did not make a major issue of it until the federal government began shifting much of the burden of public assistance to them in the late 1980s. A major local jurisdiction that consistently declined to take a "see-no-evil" stance on immigration's costs was the Los Angeles County Government. During the 1980s the Office of the County Administrator regularly compiled the rising costs of such services as indigent medical care, Aid to Families with Dependent Children (AFDC), and Medicaid to illegal aliens. Along with the high unemployment and falling tax revenues of the recession-struck early 1990s came more candor among state and local governments about the costs of illegal immigration and, to an increasing degree, about the costs of refugees and even legal and legalized immigrants. Some states have prepared analyses of immigrant costs to back up their demands on the federal government for reimbursement. Here is a brief review of major reports that have claimed significant fiscal costs of illegal, and in some cases, legal immigrants and refugees.6 Four of the following nine studies did not estimate the revenue contribution of immigrants. Agencies of the state governments of Florida, California and New York in 1993 and 1994 issued reports on the high costs to them of services and assistance to immigrants. State of Florida, Executive Office of the Governor and the Florida Advisory Council on Intergovernmental Relations. The Unfair Burden: Immigration's Impact on Florida. March 1994. Florida found that in fiscal year (FY) 1993 state and local governments had spent $2.5 billion in public assistance and service programs (including corrections and criminal justice) for immigrants. Two-thirds of that amount, $1.65 billion, was for legal immigrants. California Health and Welfare Agency. A Failed Federal Promise. January 1993; and Office of the Governor. Wilson Proposes Measures to Curb Massive Illegal Immigration (Press Release 93:620, with attachments). August 9, 1993. California estimated state and local governments spent $2.95 billion in FY -93 on illegal aliens and their U.S. citizen children for Medicaid, corrections, primary and secondary education and AFDC. Spending of state and local funds on four programs for refugees and their children reached $885 million. Amnestied aliens and their children required total state and local outlays for AFDC, Medicaid and the state share of supplemental security income (SSI) of $520 million. Total spending in the five programs assessed for these three populations was estimated at $4.34 billion. Costs of public education for children of refugees and amnestied aliens were not included. Chairman, New York State Senate Committee on Cities. Our Teeming Shore: A Legislative Report on the Impact of U.S. Immigration Policy on New York State. January 1994. Committee Chairman Senator Frank Padavan estimated that the state of New York and its localities in 1993 spent $5.63 billion in excess of federal reimbursements on social services, education and criminal justice for immigrants. The report did not differentiate between legal and illegal. Public education was the most costly outlay at $3.3 billion. Center for Immigration Studies. Estimated Annual Costs of Major Federal and State Services to Illegal Aliens. Washington, DC, 1991. In this revision of a 1989 study, the Center estimated that costs in 1990 of thirteen federally- and state-funded assistance programs for a population of 4.2 million illegal aliens and U.S. born children was $5.5 billion. This study did not cover costs of medical and social services to illegals at the county and city levels. Also not included were such costly programs as special bilingual education; and food stamps and unemployment compensation, both of which are ostensibly closed to illegal aliens. County of Los Angeles, Chief Administrative Officer. Report on the Fiscal Costs of Illegal Aliens in Los Angeles County. 1991. This report assessed taxes paid to the county by an estimated 770,000 illegal aliens and their service and assistance costs to the county. It found county revenues of $137.6 million and county outlays of $413.8 million, for a deficit for illegals of $276.2 million in FY'91. State of Texas, Governor's Office of Immigration and Refugee Affairs (GOIRA). Estimates of the Undocumented Population. 1993. GOIRA estimated there were 550,000 illegal aliens in Texas in 1992. They paid $290 million in state and local taxes and generated state and local service and assistance costs of $456 million, for a deficit of $166 million. Applying the lower estimate of the Immigration and Naturalization Service (INS) of 350,000 illegal aliens in Texas, GOlRA estimated total costs and revenues at $313 million and $183 million respectively, for a deficit of $130 million. Richard Parker and Louis Rea. Illegal Immigration in San Diego County: An Analysis of Costs and Revenues (A Study Prepared for the California State Senate, Special Committee on Border Affairs). San Diego, September, 1993. The authors found that 220,000 illegal aliens in San Diego County cost the county government and the California state government $304 million for assistance and services, including criminal justice and corrections, but paid state and county taxes of $59.7 million for a deficit of $244.3 million, or $1,110 per capita. Generalizing their findings to the entire state, they concluded that the net cost to the state government and all county governments in California for illegal aliens in 1992 was $5 billion. County of Los Angeles, Internal Services Division (ISD). Impact of Undocumented Persons and Other Immigrants on Cost, Revenues and Services in Los Angeles County: A Report Prepared for Los Angeles County Board of Supervisors. 1992. The 1992 Los Angeles study set a precedent by addressing the costs of legal, illegal and amnestied immigrant populations of Los Angeles County who entered the United States since 1980, and by estimating all taxes paid — local, state and federal. The ISD report found that total Los Angeles County expenditures in 1991-92 for county services to these three sub-populations were $947 million, while the total revenues and fees paid to the county were $139 million, for a net fiscal deficit of $808 million for the county (p.56). The per capita deficit at the county level for this population was $351. Moreover, the study population of immigrants and the citizen children of illegal aliens ran up public education costs in Los Angeles County schools of an additional $1.5 billion, not more than one quarter of which was offset by property taxes immigrants paid to the school districts. While the county's fiscal balance was the prime focus of the ISD report, it also estimated taxes paid by the three sub-populations studied to federal and state governments, but not the expenditures of those levels of government on the immigrants. 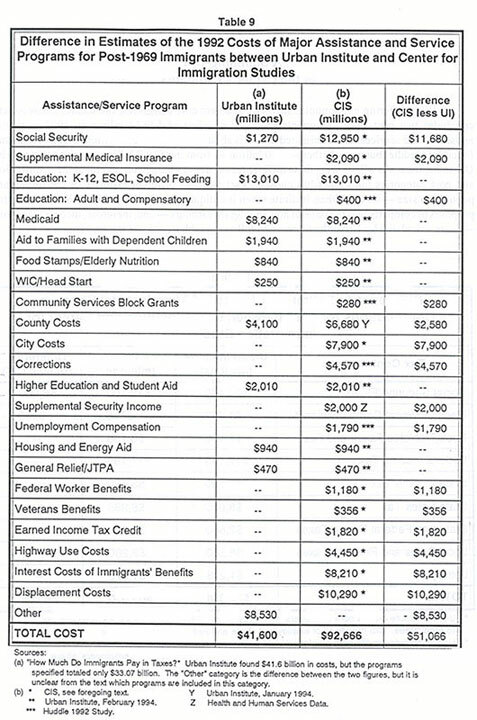 Taxes paid per taxpayer for this population were found to be significantly below those paid by the rest of the County's population (see Table 1). George Borjas. "Immigration Research in the 1980s: A Turbulent Decade." (Unpublished) Department of Economics, University of California, San Diego, 1993. Borjas finds that immigrants migrating to the United States in the period 1975-1980 will generate welfare costs of $87 billion over their lifetimes, while contributing only $29 billion to the funding of welfare programs. The net lifetime deficit for immigrants on public assistance accounts would be $58 billion, or a net cost of $3.2 billion per year. Moreover, this estimate did not include the costs of other components of the welfare state, particularly health care (pp. 28-30, Table 10). Displaced workers: He estimated the indirect public assistance costs attributable to immigrants because of the resident workers they displace from jobs. He used an estimated displacement rate of 25 percent — that is, 25 resident low-skill workers displaced for every 100 low-skill immigrants entering the labor market. 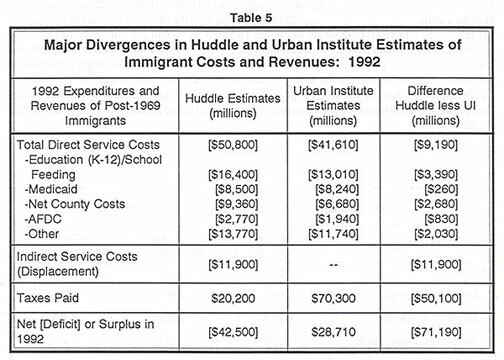 Future costs: Huddle projects for the decade 1993-2002 the cost in 1993 dollars of public assistance and services based on assumptions of the growth of the immigrant population and its earnings and tax-paying ability. Huddle's target population for study was all legal, illegal and amnestied immigrants settling in the United States since the beginning of 1970. He estimated the size of these three sub-populations of post-1969 immigrants at 19.3 million. While Huddle's critics argued that his choice of entry cohorts to study eliminated the more experienced and presumably affluent immigrants that settled here before 1970, the migration period chosen was relevant to an ongoing debate of whether the skills and adaptability of the nation's new immigrants began declining in the early 1970s because of rising shares of illegal, humanitarian and family reunification immigrants in the overall flow. 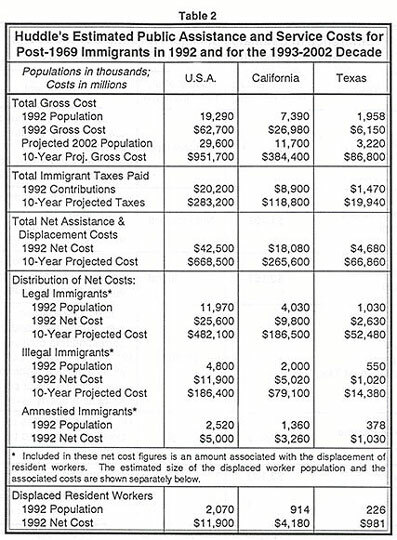 Table 2 summarizes the main findings of Huddle's 1993 reports on costs in the United States, California and Texas. Urban Institute, allied think tanks and immigrant advocacy groups that had objected to the San Diego, Los Angeles and Texas studies of immigrant costs, found Dr. Huddle's reports even more objectionable. 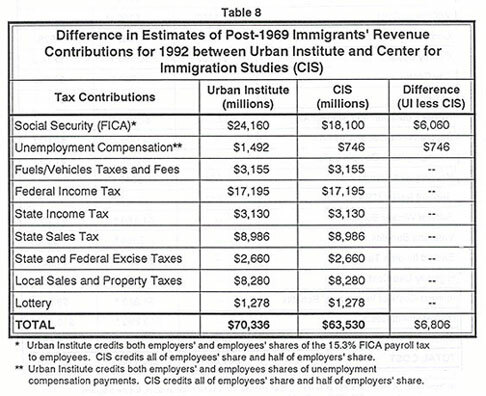 Urban Institute responded with its own series of assessments and commentaries, concluding that post-1969 immigrants in 1992 paid two and a halftimes as much in taxes nationally as Huddle estimated and did not constitute a deficit, but a surplus on public assistance accounts of $28.7 billion.8 Their critique concentrated on what they saw as the following major flaws in Huddle's reports. Huddle's exclusion of major taxes paid by immigrants. Urban Institute claimed Huddle's estimates of taxes paid by immigrants for 1992 were $50 billion too low, in large part because of his exclusion of $24.1 billion in Social Security (PICA) contributions, $3.16 billion in motor vehicle fuel taxes and fees, $6.3 billion in local sales and property taxes, and $1.5 billion in unemployment insurance payroll taxes paid by employers. Table 3 offers a comparison of the two views on taxes. Huddle's estimation of the incomes of immigrants, based on his extrapolation from the Los Angeles study findings. Urban Institute claimed Huddle erred in applying the tax-paying performance of immigrants in Los Angeles County to immigrants nation-wide because incomes of Los Angeles immigrants are atypically low. While UI claimed the result was an underestimation of at least 30 percent of taxes paid nationally, it estimated immigrant federal and state income taxes more than 100 percent higher. Huddle's estimation of the size of the post-1969 immigrant population. Urban Institute estimated the population of post-1969 settlers at 15.1 million in 1990 — 22 percent less than Huddle's estimate of 19.3 million in 1992 (Table 4). Updating the 1990 Census Bureau estimate for net immigration to 1991-1992 would bring it to 16.8 million — still 2.5 million (13%) less than Huddle's. While Urban Institute used Huddle's numbers for some of its cost calculations, for the sake of comparability, it particularly objected to his estimate of the expensive illegal population at 4.8 million in 1992,1.4 million (41 %) higher than the 1992 INS consensus number of 3.4 million. Urban Institute estimated the school-age population of immigrants 20 percent lower than did Huddle, thus producing an estimate of public education and related school costs $3.4 billion lower than Huddle (Table 5). Huddle's concept of displacement costs. Urban Institute claims no studies have produced statistical evidence of the existence of labor displacement, and thus it rejects Huddle's entire estimate of$11.93 billion in 1992 costs for public assistance to 2.07 million low-skill resident workers out of a job because of immigration. Huddle notes that the displaced are not a specific block of workers who remain permanently unemployed, as UI infers, but a changing pool of persons who want to work but are unable to do so because of immigrant competition. This pool includes unemployed, underemployed and discouraged workers, and persons never entering the labor force at all because of negative job prospects. The Institute's estimate of displacement and its accompanying cost was zero. The gap of $71.2 billion between the two estimates is striking, indicating profound differences in methods, assumptions and intent in the two studies. 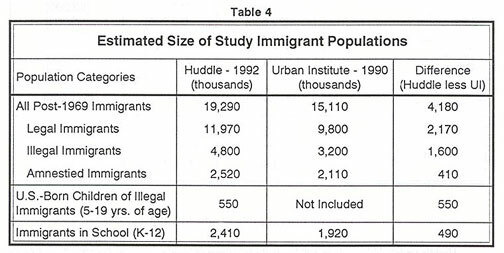 Huddle updated his study in 1994 to include estimated immigrant costs for 1993,9 modifying methods and assumptions for his estimates in accord with constructive criticisms received on his first report. Newly available income data on the U.S. foreign-born population were used in place of data from the Los Angeles study. Nearly all taxes excluded from his first study were calculated. In the case of earmarked taxes, the costs of the programs they financed were pro-rated to the immigrant population. Social Security FICA contributions, at the rate of 50 percent of employer contributions and 100 percent of the employee contributions were credited to immigrant workers. At the same time, the post-1969 immigrant population was charged with a pro-rata share of the 1993 costs of social security benefits, based on its share of the U.S. labor force and adjusted for the lower average earnings of immigrants compared to the national average. Estimates of major assistance programs were adjusted in most cases upward to reflect higher per capita costs and a larger user population. Inclusion of all taxes and, in the case of social security and other earmarked taxes, the spending programs financed by them sharply increased both the revenues from immigrants and the costs immigrants entail. The bottom line estimated fiscal deficit, however, did not change markedly: The 1992 deficit of $42.5 billion rose under the revised methods and assumptions to $44.2 billion in 1993. 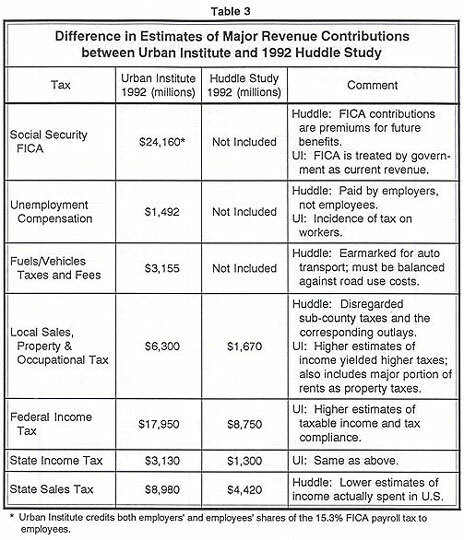 Table 6 summarizes the major findings of Huddle's 1992 and 1993 studies. What is to be made of these three assessments — two by Huddle and one by Urban Institute — that offer such strikingly different bottom lines? A net deficit on public assistance in the low to middle $40 billions in Huddle's two studies becomes a hefty surplus of $28.7 billion by the Urban Institute's reckoning -a gap between the two conclusions of more than $70 billion. Here are some of the key divergences of both assumptions and outcomes between the two research efforts that contributed to the gap. 1.) Immigrant Population Size. Urban Institute's estimate of post-1969 foreign-born residents, 15.11 million in 1990, is overly conservative. It sticks closely to Census numbers, but, unlike the Census Bureau, is not prepared to acknowledge an undercount that is especially high in the populations targeted in these studies. Huddle's estimate, on the other hand, is high: for 1992 he estimates a post-1969 immigrant population of 19.3 million, and by implication a total foreign-born population of 23.5 million. He includes an estimated 1.48 million legal and illegal aliens missed by the 1990 census. The Center estimates the foreign-born population at 21.5 million in mid-1992, not allowing for the Census undercount of as much as five percent, which would bring the total to 22.6 million. Of this population, 18.4 million would be assigned to Huddle's study population of post-1969 immigrants, suggesting that Huddle's estimate may be nearly one million too high. Urban Institute's estimate of the settled illegal immigrant population in 1992 at 3.2 million is based on recent INS estimates, which were subsequently updated to 3.4 million. Huddle claims 4.8 million illegals, plus 550,000 school-age U.S. citizen children of illegal immigrants. The 1.6 million population gap makes it possible for Urban Institute to reduce costs associated with illegal immigrants by $3.37 billion below Huddle's. Yet Huddle's estimate of illegals in 1992 is within the range of both Census and INS estimates. Census estimates of illegal immigrants in 1990 ranged to a high of 4.5 million, a figure which by 1992 would reach 4.9 million to 5.1 million depending on whether Census (200,000) or INS estimates (300,000) of subsequent annual growth are used.10 The Center considers the estimate of 4.8 million defensible for cost estimates in 1992. It also agrees that a valid case can be made for including cost estimates associated with the estimated 550,000 citizen children of illegal immigrants included in the 4.8 million estimate. 2.) Taxes and Social Security Contributions. Huddle's 1992 data estimated total tax payments of the post-1969 immigrant population too low at $20.2 billion. This estimate had more than seven percent of the U.S. population, and more than nine percent of the labor force, paying about one percent of all taxes. Huddle recognized this and corrected the estimates in his 1993 data. Although Huddle's underestimation of the post-1969 population's incomes-and, therefore, tax payments -is a partial explanation of the revision, Urban Institute credited the sub-populations under study with $24.2 billion in social security (PICA) taxes and $9.28 billion in three other earmarked taxes that Huddle deliberately chose not to include (see Table 2). The inclusion of these questionable tax revenues alone explains much of Urban Institute's finding of a $28.7 billion surplus for immigrants. Social security contributions are a major case in point. Are they a tax or are they comparable to insurance premiums, which are contractual payments toward the purchase of a future benefit? Huddle initially treated them as the latter, including neither the contributions nor the cost of benefits paid to the post-1969 immigrants. Urban Institute, on the other extreme, credited both employer and employee FICA contributions pertaining to this population to the immigrant workers. Then Urban Institute debits this post-1969 immigrant population only the $1.27 billion in benefits paid to those entering since 1970, a relatively young population. Urban Institute assumes that employers invariably shift the cost of their social security contributions to workers through lower wages and benefits. A more realistic assumption is that employers can shift only about half of their contributions to the workers. Most of the remainder is passed on to consumers, with some borne by the employers themselves as lowerprofits.11 Thus, post-1969 immigrant employees could be credited at most with $18.1 billion in PICA contributions. The social security system now pays out more that $300 billion yearly in Old Age Survivors and Disability (OASDI) payments. Urban Institute asserts that post-1969 immigrants, over 7 percent of the population, should be debited for just 0.5 percent of social security outlays. The actuarially questionable assumption here is that 18.4 million post-1969 immigrants are responsible only for their own social security benefits; the remaining 92.7 percent of the population is responsible for 99.5 percent of social security costs — including those of retired earlier immigrants. In his 1993 revision Huddle determines the post-1969 immigrant workers' share of the cost to be $17.5 billion, based on their proportion of the labor force, adjusted by their lower average incomes. The Center finds it more appropriate to debit the post-1969 immigrant population with a pro rata share of OASDI payments to the foreign born. OASDI payments to the foreign-born in 1993 are estimated at $16.6 billion. Seventy-eight percent of the immigrant population under 65 years old are post-1969 immigrants. Seventy-eight percent of $16.6 billion is $12.95 billion in OASDI payments chargeable to post-1969 immigrants. Thus the surplus for this population on social security is $3.65 billion, rather than the $22.9 billion found by Urban Institute. Federal and state motor vehicle fuels and operating fees and taxes present a special problem. Their proceeds finance mostly the motor vehicle transportation system, not a spending category generally considered to be public assistance, social service or income transfer. Urban Institute insists on including these revenues in its assessment, estimating them at $3.16 billion in 1990 for the study population but offering no estimate of the public outlays for motor vehicle and transit support that would correspond to this population. Yet, clearly immigrants benefit as much, if not more, from expenditures on transportation, especially public transport. State and federal outlays for highways and other motor vehicle support in 1992 ($60.18 billion) exceeded funds collected from earmarked taxes ($54.92) by 9.6 percent. Using Urban Institute's estimate of the post-1969 immigrants' contribution in federal and state fuel and motor vehicle taxes allows an estimate that the post-1969 population paid out $3.155 billion in taxes, while its proportional share of the associated costs was $4.45 billion for a deficit of $1.29 billion. Local property taxes, according to Urban Institute, paid by post-1969 immigrants, totaled $5.97 billion in 1990. Both Huddle and Urban Institute in their 1992 reports addressed major county costs, but did not specifically estimate costs of assistance and services provided by city governments. 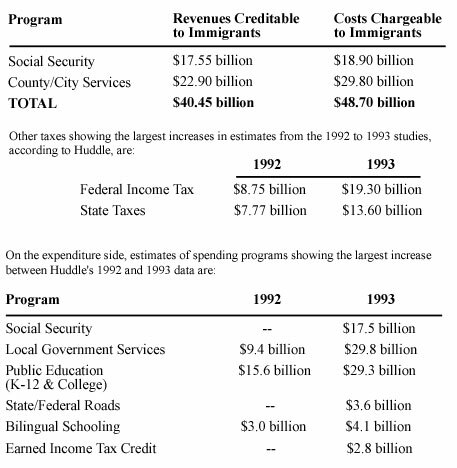 In his 1993 update, Huddle estimated a single category of city-county services as showing a net after-tax cost of $6.88 billion. The Urban Institute's estimate o local property taxes appears to be high, considering a larger proportion of post-1969 immigrants are low-wage earners and renters, but they do not explain their method for determining the incidence of property taxes on rental properties. The Center nevertheless uses their calculations to estimate the post-1969 immigrant fiscal balance at the city level. What adjustment of overall displacement would result from the Center's estimating the post-1969 immigrant population 4.7 percent below Huddle's estimate? There is evidence that a portion of displaced workers are themselves settled immigrants.14 How should cost estimates be adjusted to eliminate double counting of aid to displaced immigrant workers and assistance paid to immigrants in regular public assistance categories? Huddle's estimates of the proportion of post-1969 immigrant sub-populations who are unskilled, based on INS data, are reasonable: 62.3 percent of working-age legal immigrants and 80 percent of working age illegal and amnestied aliens. He estimates the total number of workers displaced by immigrants at 2.07 million for 1992. Our analysis uses an estimate of 18.4 million for the post-1969 immigrant population, compared to Huddle's 19.3 million, but groups them by sub-population somewhat differently, as Table 7 indicates. The above estimate of displaced workers is only slightly (0.48%) lower than the Huddle estimate for 1992. The smaller estimate of the immigrant population size resulted in nearly the same amount of displacement, chiefly because 700,000 de facto residents were assumed to have the same proportion of low-skill workers as illegal and amnestied aliens, i.e., 80 percent. Using this slightly lower calculation, Huddle's displacement cost estimate would drop from $11.9 billion to $11.84 billion. To adjust Huddle's estimate of displacement costs for double counting, this analysis assumes, first, that the proportion of immigrants among the displaced workers is equivalent to their percentage of the overall labor force, 9.3 percent. Then, using native and immigrant high school non-completion rates as a proxy, it is estimated that immigrants are 41 percent more likely than U.S. workers to be low-skilled. The formula is 9.3 percent multiplied by 1.41 equals 13.1 percent, the estimated likelihood that immigrants will be among the low-skill displaced workers. This implies a population of almost 270,000 displaced immigrant workers whose public assistance and service costs have been accounted for elsewhere in the general cost estimates. The removal of this sub-population reduces total estimated displacement costs, at $5, 749 per worker according to Huddle, to $10.29 billion. 4) Additional Costs Overlooked by Urban Institute and Huddle. Both Huddle and Urban Institute overlooked some important costs of public assistance and services to immigrants in their calculations. If all contributions in the form of taxes paid by immigrants or on their behalf are to be summed on the positive side of the ledger — as Urban Institute does — then all government operations that are funded by those revenues should be proportionately ascribed to the immigrant population as an offsetting cost. They are summarized here. Interest: Cost of financing assistance and income transfer programs. Interest payments of federal, state and local governments totaled $241 billion in 1992. Interest corresponding to public assistance, education, health and other income transfer programs serving immigrants was $52.04 billion at the state and local level and $62 billion at the federal level. The proportional share of post-1969 immigrants of these interest costs in 1992 ( at 7.2 percent) was $4.46 billion federal and $3.75 billion state and local. Total cost: $8.21 billion. Earned Income Tax Credit (EITC). EITC was not included by Urban Institute researchers either as a public assistance cost or as a tax offset. A 1993 Center for Immigration Studies report calculated total EITC received by immigrants at $1.57 billion in 1990.15 A multiplier of 7.7 percent increase per year is used to adjust immigrant EITC payments to 1992, representing 4.2 percent for the increase in the foreign born population and 3.5 percent for inflation. The estimate for 1992 is $1.82 billion. Federal Employee Benefits and Disability costs. These costs in 1992 exceeded employee contributions by $32 billion. Post-1969 immigrants, share of the federal work force is now 3.7 percent. 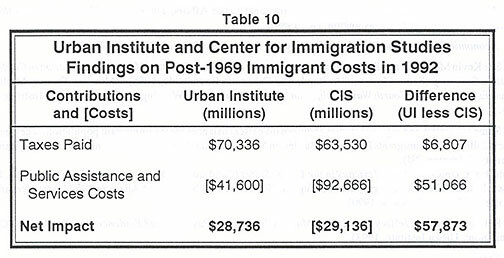 Cost attributable to post-1969 immigrants: $1.18 billion. Medicare B, Supplemental Medical Insurance (SMI). The portion of SMI financed from general revenues in 1992 was $39.0 billion. The proportional share of the post-1969 immigrant population, 7.2 percent, is reduced by 26.4 percent, because the foreign born have a lower likelihood than natives to receive social security. The resulting recipiency factor of 5.37 percent yields a share of this cost for the immigrant population of $2.09 billion. Veterans benefits cost $35.7 billion in 1992, or $1,300 per veteran. The 273,500 veterans shown in Census data in the post-1969 immigrant population produced VA costs of $356 million. The total cost of immigrant recipiency under the preceding five spending programs included in neither the Huddle study nor the UI study is $13.66 billion. 5) Costs of Fraud. Additional costs associated with illegal immigration are more difficult to estimate because of the inadequate government enforcement effort. There is ample evidence of some incidence of welfare program usage by illegal aliens, despite their not being eligible. This may occur through an alien's fraudulent documentation as an American citizen or, in some cases, as a legal immigrant. The program mandated by law in 1986 to verify the eligibility of aliens for federal welfare programs is not even being used by the Department of Housing and Urban Development (HUD) for its housing subsidy programs. Although there clearly are costs associated with fraud, the data presently available are insufficient for cost estimates. Similarly, enforcement efforts of the INS and the Department of Labor, as well as studies such as that by the Commission on Agricultural Workers, have documented continued employment of illegal aliens in "off-the-books" jobs. The employers pay neither the minimum wage not the required unemployment insurance or social security contributions. These workers are unlikely to be counted in the census. Therefore, estimates of the earnings of immigrants and their tax contributions based on census data are likely overestimated. But, accurate data are lacking. Nevertheless, these illegal aliens benefit from government services and they send their children to public school. A Summing-Up: How Does the Center's Estimate Compare? With differing assumptions, methods and new cost categories, the Center's assessment concludes that post-1969 immigrants produced a deficit of $29.14 billion in 1992 in public assistance and services. This estimated deficit is about one-third — $15 billion — lower than that found by Huddle, but even farther — $60 billion — from the $28.7 billion surplus estimated by Urban Institute. As will be seen, these differences occur even though on several of the contribution and cost categories the Center has chosen to set aside its different estimate of the immigrant population size — as did Urban Institute when it critiqued the Huddle study. Also set aside for purposes of comparison is the issue of how immigrant earnings — and, therefore, income taxes paid — were calculated by Urban Institute. The following tables compare the assessments. The Center's calculations show annual services and assistance costs for post-1969 immigrants of $92.67 billion against revenue contributions of $63.53 billion, for a total annual fiscal deficit in public assistance and services of $29.14 billion (Table 10). This represents a per capita deficit of $1,584 for post-1969 immigrants on public assistance and service accounts alone. In its rebuttals of the Huddle, Los Angeles and San Diego studies, Urban Institute stresses that these studies overlook the economic benefits of immigration, such as job creation, investment in businesses and increased demand for goods and services. The Institute, however, made no attempts to quantify any specific economic benefit that could be evaluated. The Center agrees that the non- fiscal costs and benefits, such as natural resource depletion, ethnic tensions and cultural diversity, may be as important as the tax-services balance. However, before accepting non-fiscal benefits as a given, they deserve greater study, along with the proper inclusion of all societal and environmental costs that go with increased population and rapid economic growth. 1 Julian Simon, Tile Economic Consequences of Immigration (New York: Basil Blackwell, 1989). 2 See Sidney Weintraub and Gil Cardenas, The Use of Public Services by Undocumented Aliens in Texas, Public Policy Research Report 60 (LBJ School of Public Affairs, University of Texas, Austin, 1984). 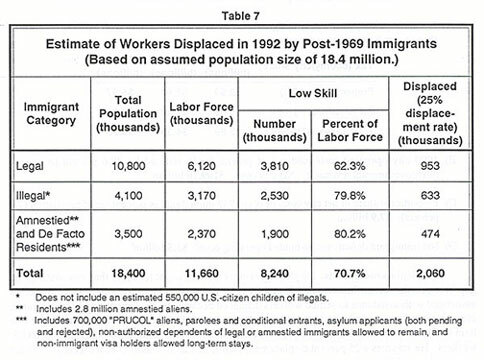 3 U.S. Department of Labor, Bureau of International Labor Affairs, The Effects of Immigration on tile U.S. Economy and Labor Market (Washington, DC, 1989). 4 Economic Report of the President (Washington: Government Printing Office, 1986). 5 See Kevin McCarthy and R. Burciaga Valdez, Current and Future Effects of Mexican Immigration in California: Executive Summary (Santa Monica, CA: Rand, The California Roundtable, 1985). Also see Thomas Muller and Thomas Espenshade, The Fourth Wave: California's Newest Immigrants (Washington, DC: The Urban Institute Press, 1985). 6 Some other state and regional studies show positive fiscal balances for the immigrant population. They include: Nancy Collins, "Do Immigrants Place a Tax Burden on New Jersey Residents?" (Department of Economics, Princeton University, Princeton, NJ); David Heer, Undocumented Mexicans in the United States (Cambridge, UK: Cambridge University Press, 1990); Massachusetts Office of Immigrants and Refugees, "Revenues Paid by Resident Aliens in 1987" (State Department of Health and Human Services, 1990). 7 Rebecca Clark and Jeffrey Passel, How Much do Immigrants Pay in Taxes? Evidence from Los Angeles County (Washington: Urban Institute, 1993). 8 See: Rebecca Clark, Manuel Garcia y Griego and Jeffrey Passel, How Much Do Immigrants Really Cost? 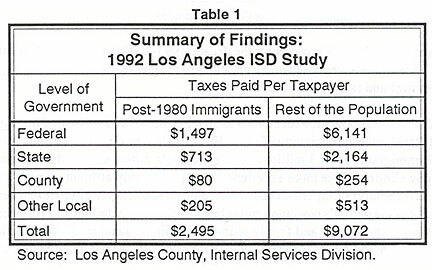 (Los Angeles: Tomas Rivera Center/Urban Institute, 1994); Clark and Passel, How Much Do Immigrants Pay in Taxes? Evidence from Los Angeles County (Washington: Urban Institute, 1993); Michael Fix and Passel, "Immigrants and Welfare: New Myths and New Realities," Testimony before the U.S. House of Representatives Subcommittee on Human Resources, Washington, November 15, 1993; Fix and Passel, Immigration and Immigrants: Setting the Record Straight (Washington: Urban Institute, 1994); Passel, Immigrants and Taxes: A Reappraisal of Huddle's "The Cost of Immigrants" (Washington: Urban Institute, 1994). 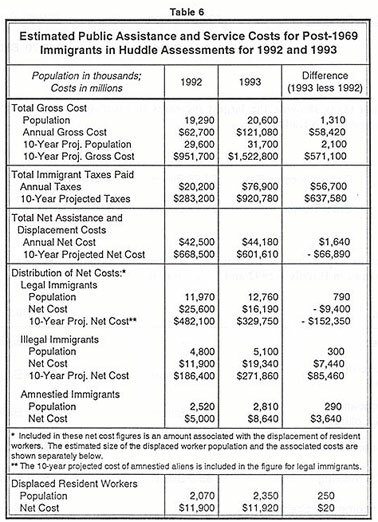 9 Donald Huddle, The Net National Cost of Immigration in 1993 (Washington: Carrying Capacity Network, 1994). 10 Robert Warren, "Estimates of the Unauthorized Population Residing in the United States, by Country of Origin and State or Residence: October 1992" (Washington: Immigration and Naturalization Service, April 1994). J. Gregory Robinson, "Review of Estimates on the Size and Geographic Distribution of the Undocumented Immigrants," Written statement of the Bureau of the Census to the U.S. Senate Committee on Appropriations (Washington, June 22, 1994). 11 Ronald Ehrenberg and Robert S. Smith, Modern Labor Economics (New York: Harper Collins, 1991), p. 75. 12 See Daniel Hamermesh, "New Estimates of the Incidence of Payroll Taxes," Southern Economic Journal (February 1979), pp. 1208-19. 13 Donald Huddle, "Undocumented Workers in Houston Non-Residential and Highway Construction: Local and National Implications of a Field Survey," Manuscript (Department of Economics, Rice University, Houston, 1982). "Dirty Work: Are Immigrants Only Taking Jobs that Native Workers Don't Want?" Population and Environment (Vol. 14, No.6, July 1993). 14 See Vernon Briggs, "Mexican Workers in the United States Labor Market: A Contemporary Dilemma," International Labor Review (Vol. 112, November 1975). Philip Martin, Illegal Immigration and the Colonization of tile American Labor Market (Washington: Center for Immigration Studies, 1986). Report of tile Commission on Agricultural Workers (Washington, 1992). 15 David Simcox, "The Earned Income Tax Credit: A Costly Immigration Magnet," SCOPE (No.16, Fall 1993).